Weighty Matters: All You Can Eat Blue Jays! So the trend of all-you-can-eat admission to baseball games has made it to the great white north. "Nearly half of the major league baseball teams in the U.S. have added the "all-inclusive" seats. Nine NHL teams offer them, six NBA teams have them and NASCAR is selling the tickets at several of its racetracks." Want to be an early-adopter? 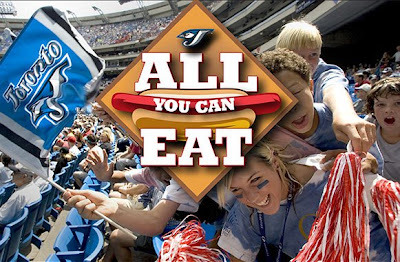 For just $39 you can watch the Jays take on the Kansas City Royals and "enjoy" all you can eat hot dogs, nachos, popcorn, peanuts and soft drinks. Sorry, no pizza or beer for you. Hope you can take your head out of the trough long enough to watch the game.